While I was “away” making curtains and doing alterations and making nice things for other people, this project was burning a hole in the back of my mind! Now the new year is here, the kids are back at school and making for others has quietened down a bit, I can finally get cracking again. 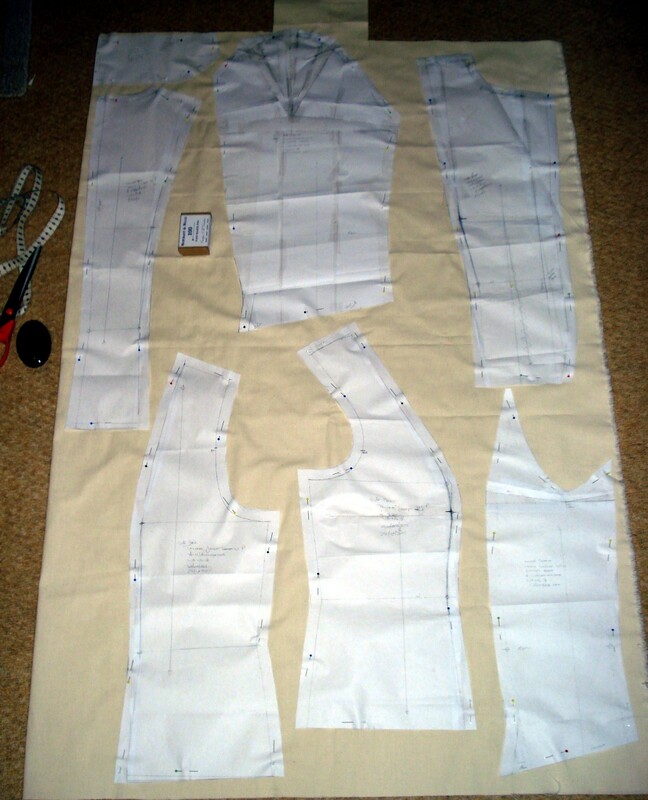 I decided to track the progress of this jacket, to show the internal workings of speed tailoring a jacket. I have a cashmere that is definitely not going in the machine. I dampened down 2 double flat sheets (you could use old duvet covers) and sandwiched the wool between them. I rolled the whole lot up like a Swiss Roll and left for the damp to get through the wool. Then opened it up and draped over a balustrade/handrail. If you have to use the washline, first cover the wire with a towel, and if possible, drape over two lines, not just one. Leave to dry, then dry iron to remove creases. Iron on the wrong side, and check for any imperfections. Mark these so you can avoid the area when laying out the pattern pieces. It really is worth taking time when preparing wool for a jacket. The fabric is rarely cheap, and considering the amount of time you will take to put the item together, it will be pretty soul-destroying to have it go wrong. Your next job is the interfacing. I use a speed tailoring jacket pack that I get from Gill Arnold. 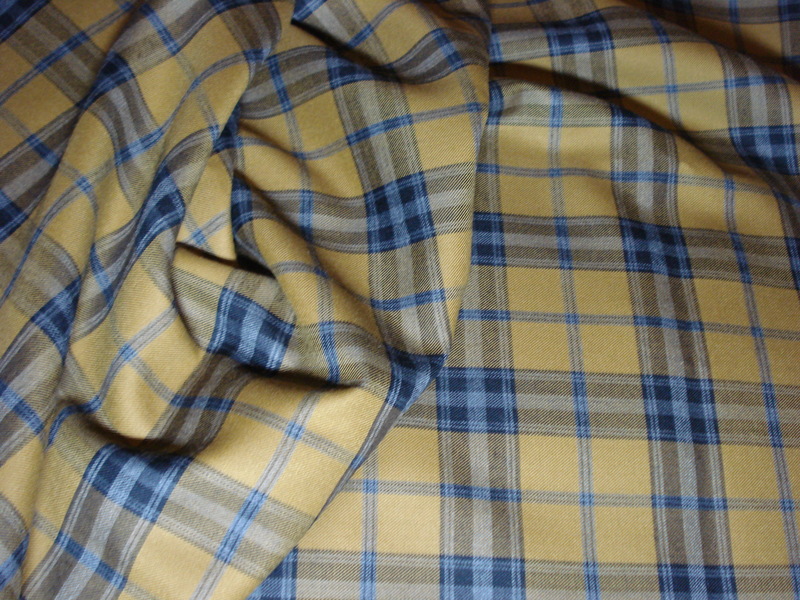 On this particular wool I have used her Weft insertion on the jacket shell and the fine sheer fusible on the facings. I have also used some iron on canvas, and some non-iron canvas. 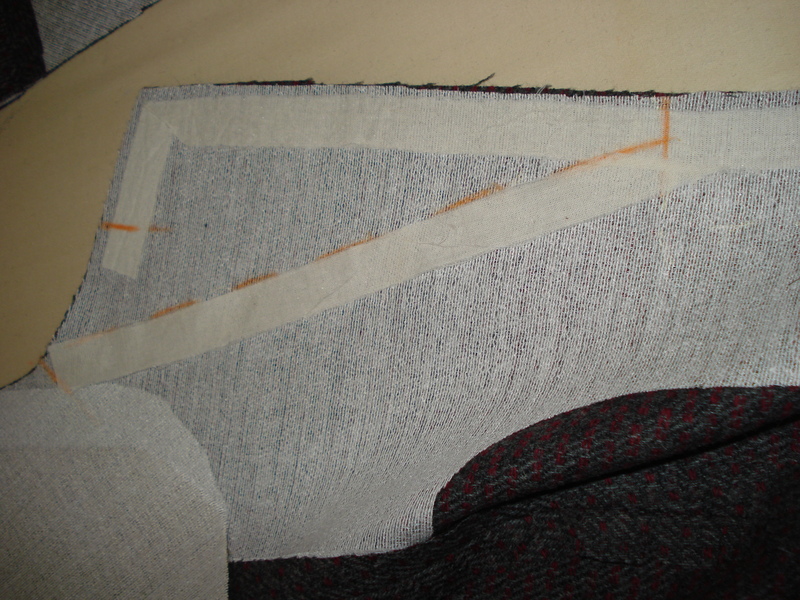 I interfaced the “T-zone” and all the hem edges with the weft insertion. This covers all the areas of the jacket that are put under strain or will be sat on and crinkled! Then I made up the fronts and back. 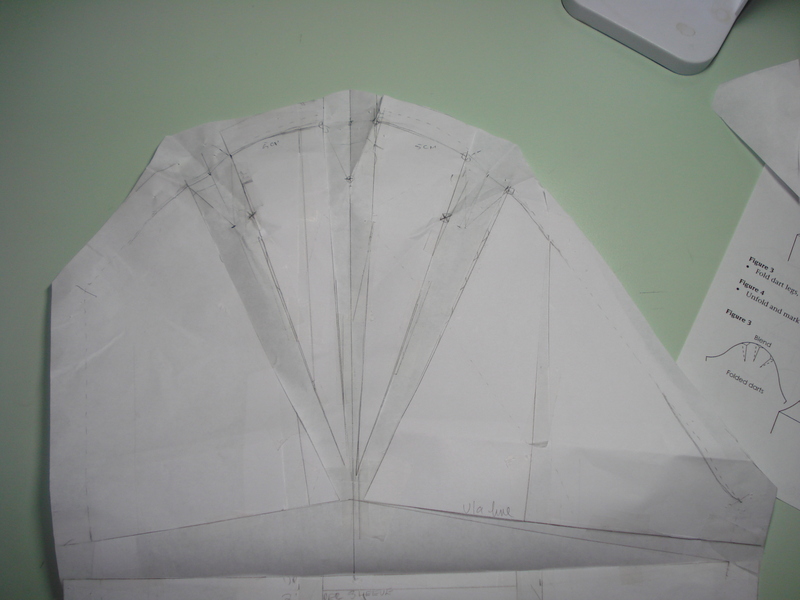 The next step was to apply a fusible cotton tape to the front seam, this prevents stretching on the front seam. It is applied about 5mm in from the fabric edge and if you have a curve at the bottom, you will need to snip into it to take the corner. Once that was done, I made the canvas chest pieces. This is done to plump out the hollow in the chest that women have just below the shoulder. You will need the non-iron canvas and some weft insertion for this part, and each pattern needs a different shape chest piece. The pieces are cut on the bias. 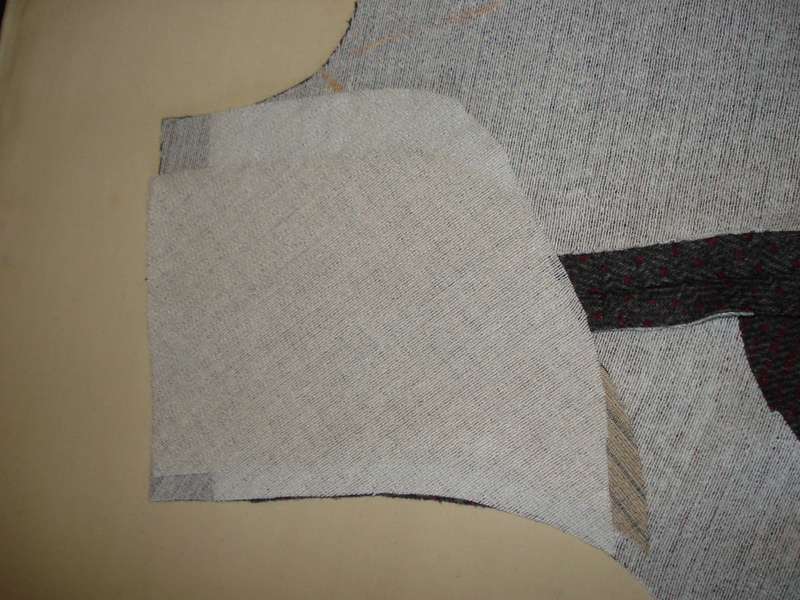 The weft insertion interfacing is a different size to the canvas. 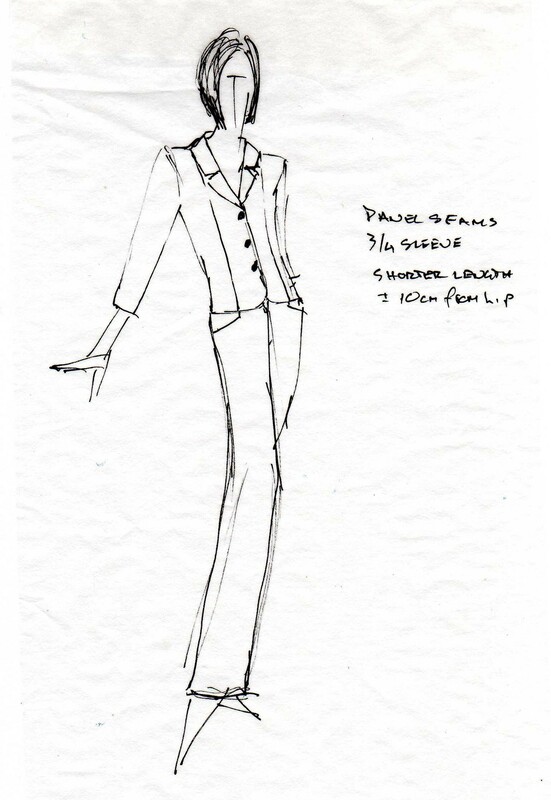 It is 1cm larger on the armhole side, and 2.5cm larger on the neckline side. 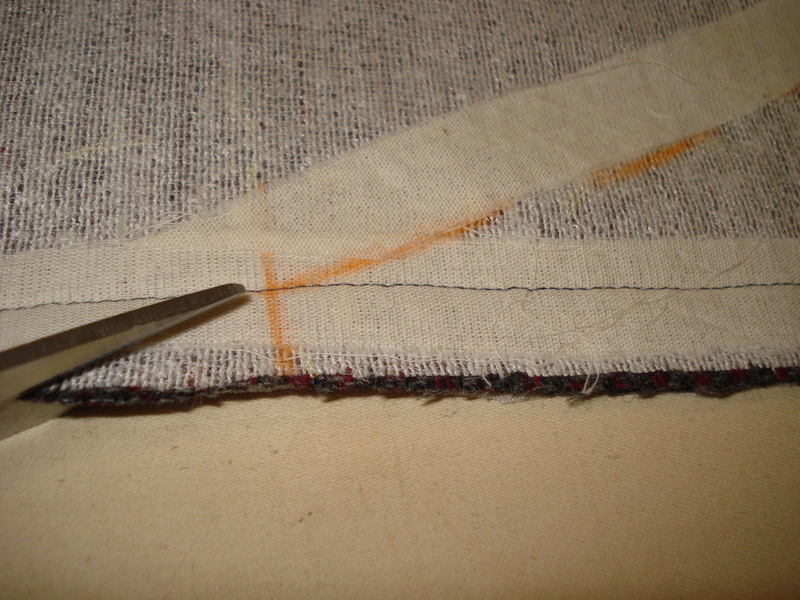 Fuse the canvas to the weft insertion, taking care not to attach the overlapping interfacing to anything. Trim the top corners, cut a box 1×2.5cm and 2.5×2.5cm. 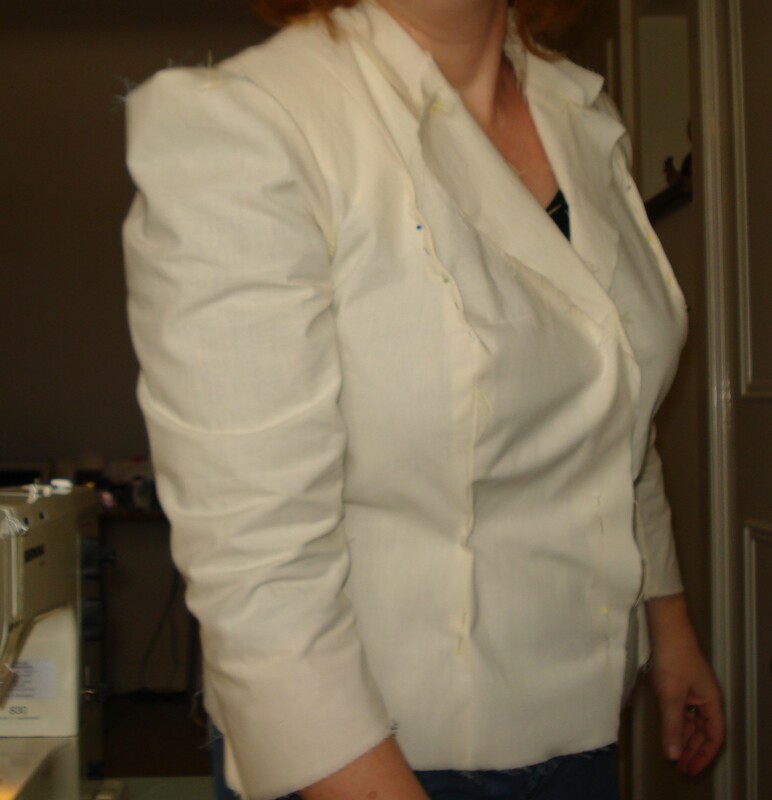 Place the chest piece on the jacket front with the armhole side on the edge of the fabric and fuse the overlapping interfacing to the jacket on both sides. Next fuse cotton tape to the breakline of the rever. This helps the rever to fall in the right place, and to stay there! There is no need for padstitching the create the fall. 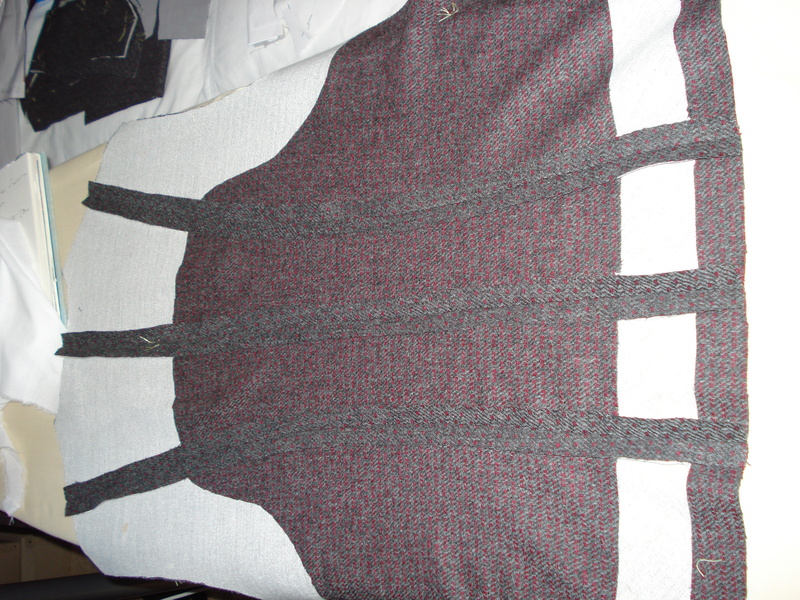 Now staystitch the neckline on the facings, jacket front and back. Once that is done, pin on the facing. The facing is between 2.5mm and 5mm bigger/wider than the front on the rever up to the breakpoint only. This is to accommodate the turn of cloth. You don’t want to see the seamline or any of the fabric from the front rever peaking out. The fabric needs to be manipulated carefully so you don’t get any puckering, pinch the excess at the corner and pin the “blister”. 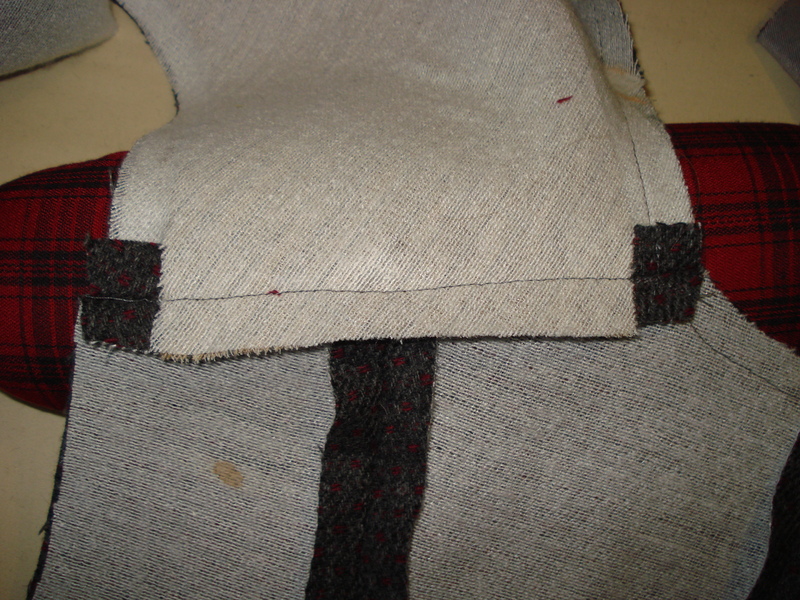 Sew the front facing on from the podmark for the collar join to the hem. 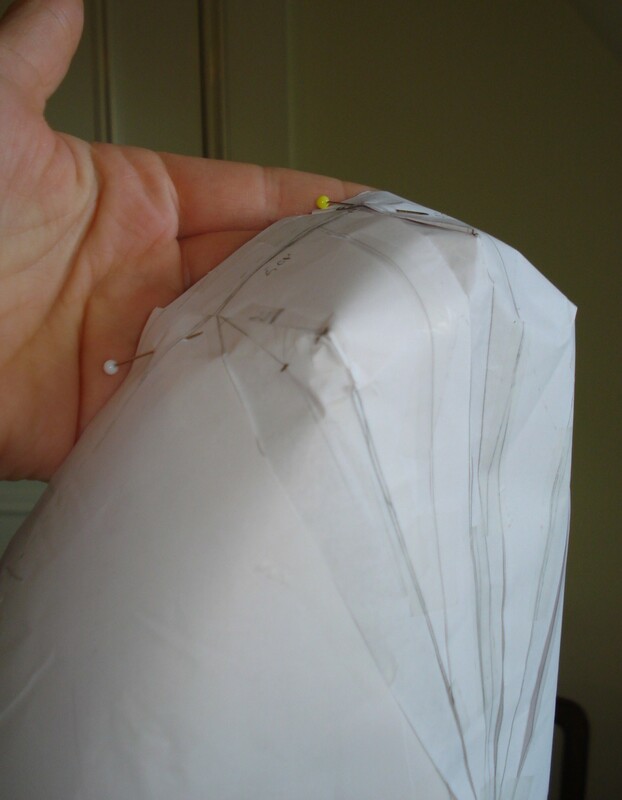 Snip the seam allowance at an angle at the breakpoint and layer the seams. Trim both of the seam allowances down by 5mm. 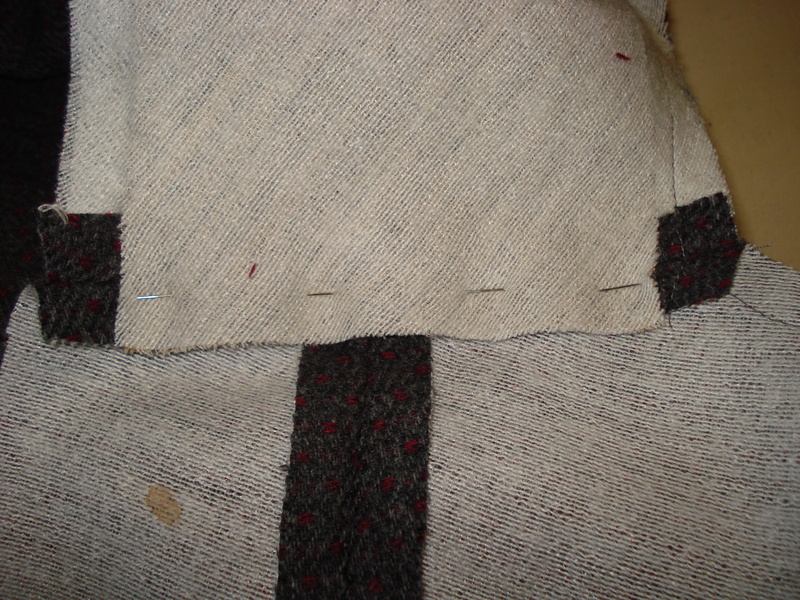 Then trim the seam allowance of the front facing by a further 5mm. The rever needs to be trimmed too, but trim the front by a further 5mm, and not the facing. Press the seams open and then flat. 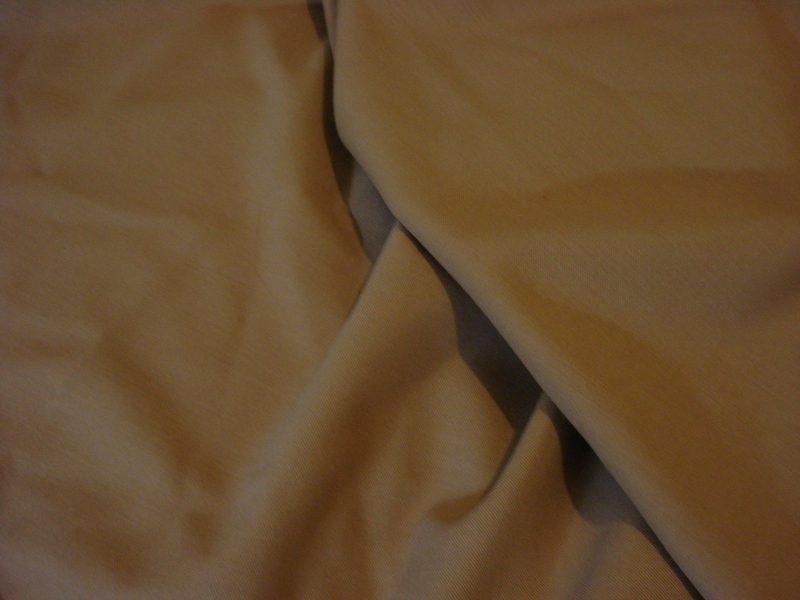 Ensure you roll the fabric when steaming so there is no seamline showing. Now for the shoulder seams. Pin the canvas away from the shoulder line and pin the fronts to the back. 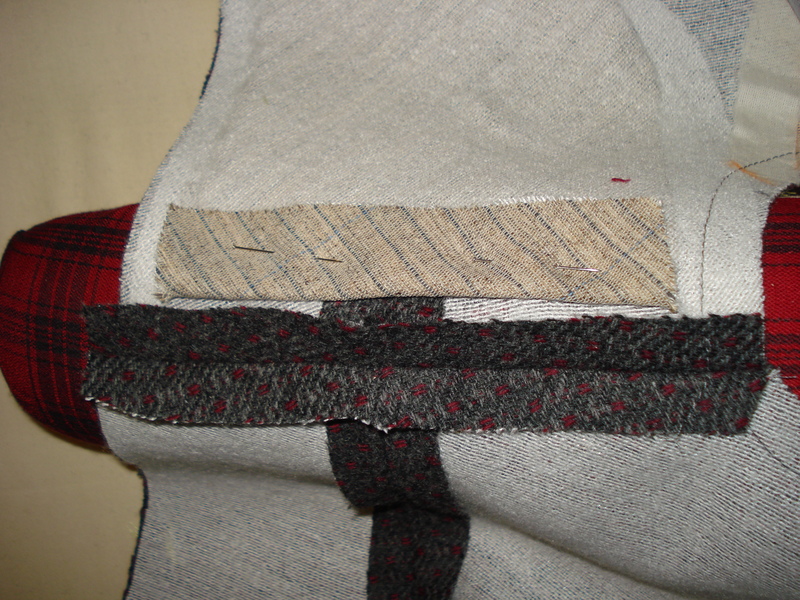 Stitch and press open over a sleeve roll. Remove the pins from the canvas and let it extend past the seamline onto the back. 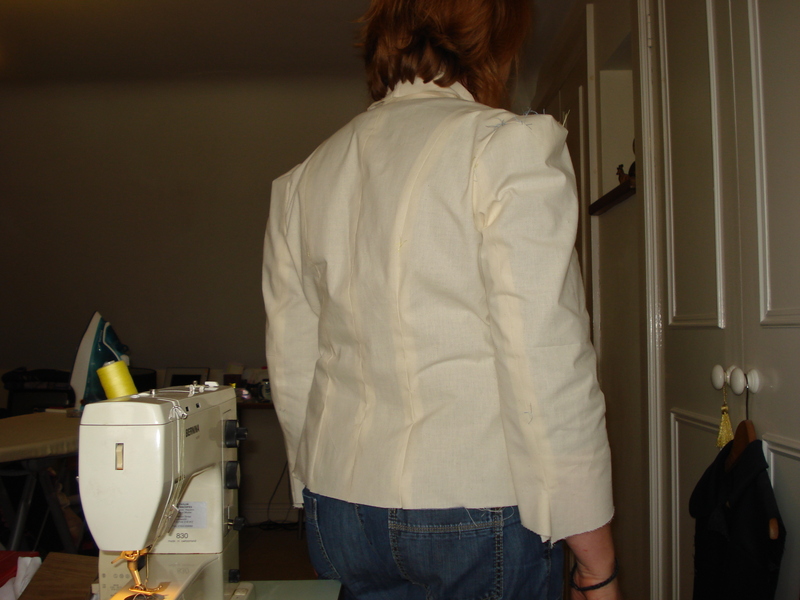 Turn the right way round and put your hand under the shoulder seam. Pin along the seamline, going through all the jacket layers as well as the canvas. Turn to the inside and pin the back seam allowance to the canvas. 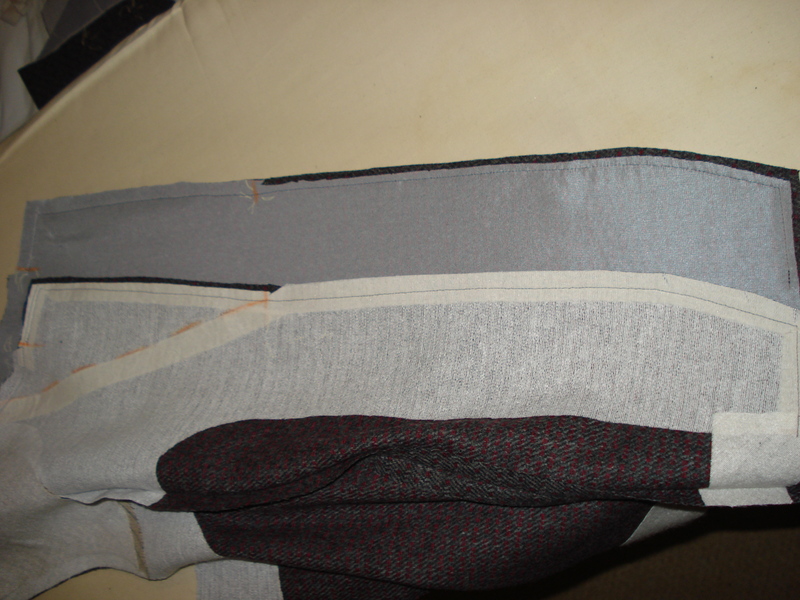 remove the pins from the outside and then stitch the canvas to the seam allowance, close to the shoulder seam line. 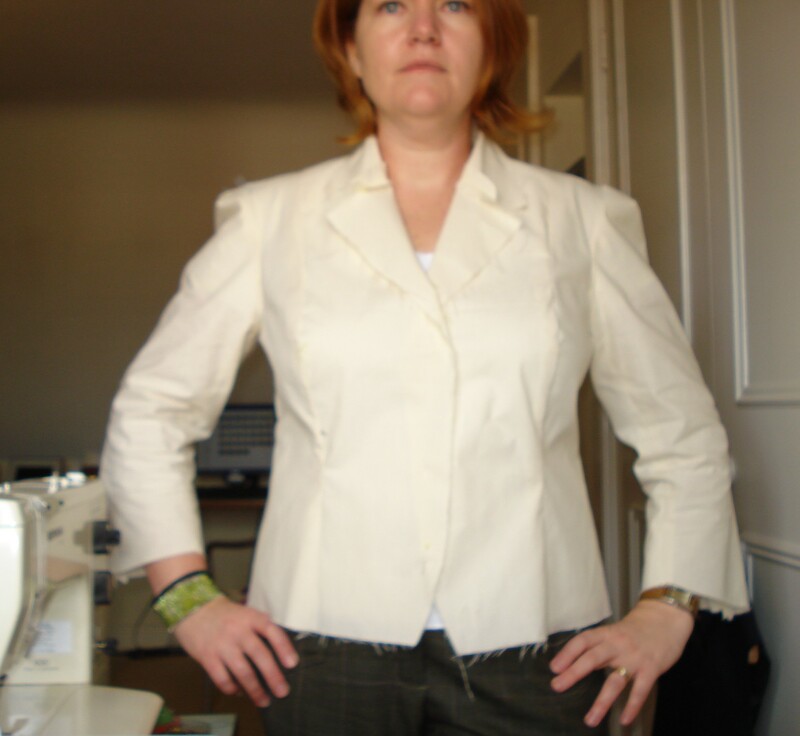 So that’s the body of the jacket, ready for the collar and then the sleeves. 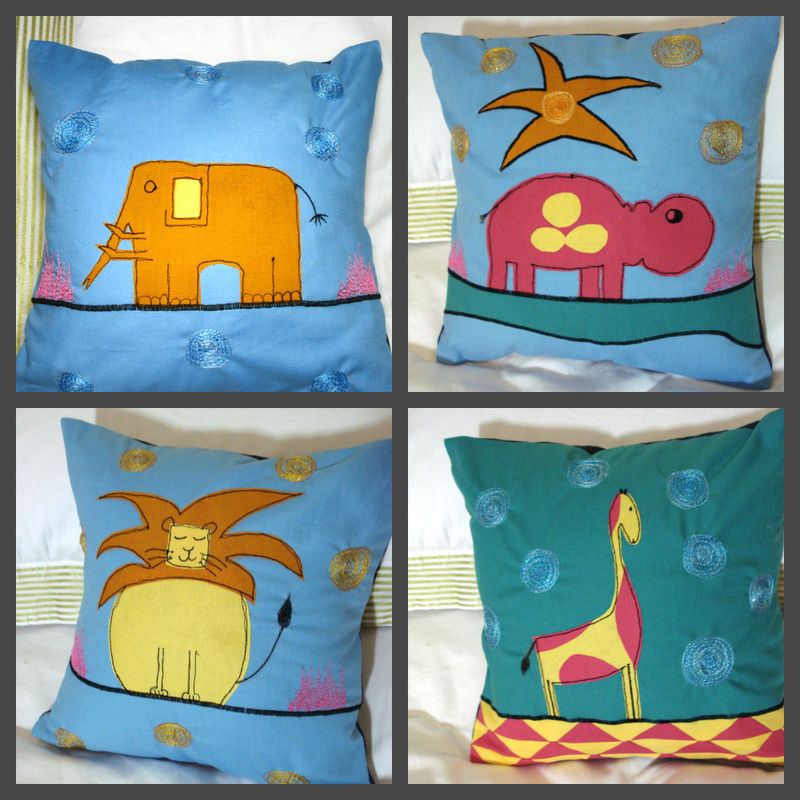 Happy sewing until next time! Well, it has been a while! Alopogies for being AWOL. I must be the most frustrated sewist around at the moment! I haven’t been able to get near my own work for a long time now. However, I am chronically incapable of using the “no” word, so I guess the pain has been self inflicted. My New Year’s Resolution?? To be more disciplined, and to say “NO”! A very Happy New Year to all, may you have many opportunities to succeed beyond your expectations! After finishing the cushions the other day I am really inspired to get going and finish the jacket and coat I started the patterns for last month. 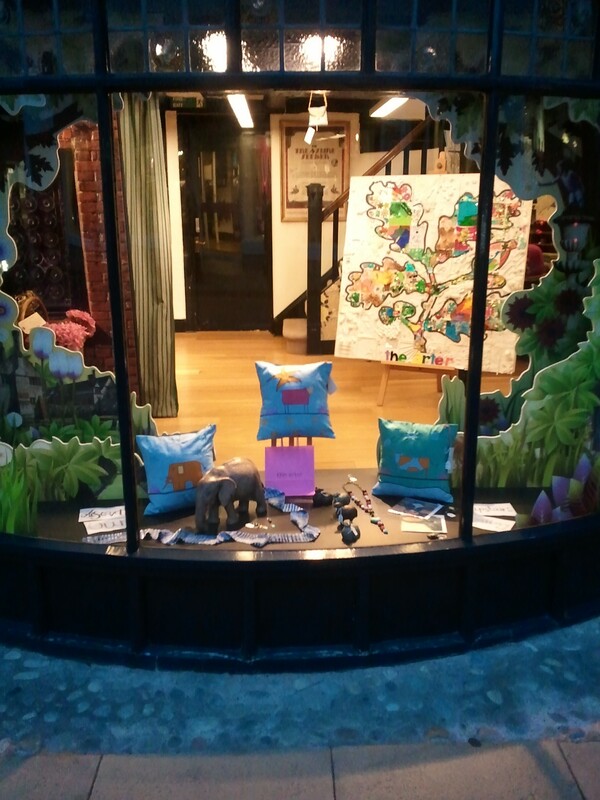 However – Daughter no 2 and Husband and I went into Birmingham on Friday…. 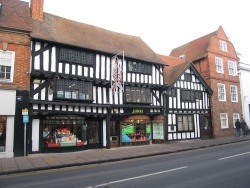 A quick visit to the Fancy Silk Store and a much longer visit to the Bullring has resulted in more fabric and more ideas! But – a pop into the French Connection store put something else in the front of the queue… She found this coat, and can I please make one of these??? We also slipped into the Waterstones in the Pallisades. 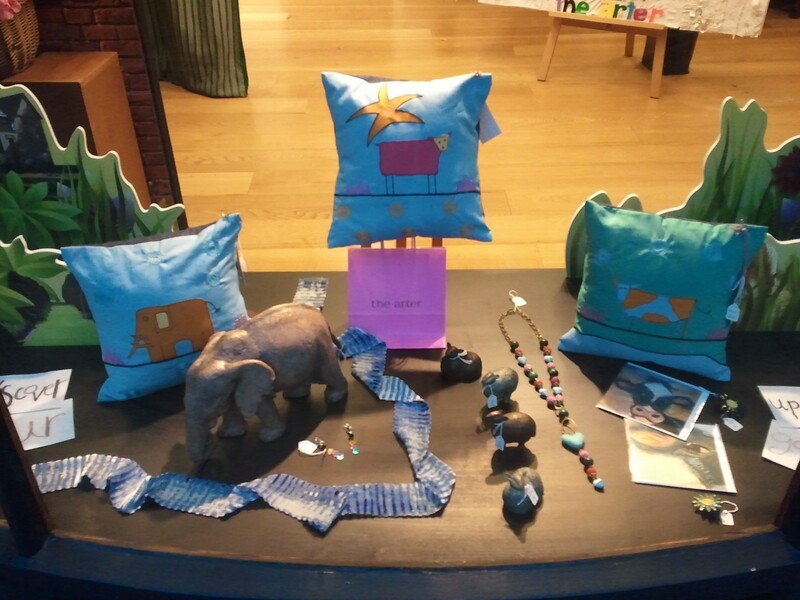 The best part of the shop is right at the very top – 4th floor- in the Book Garden. Daughter no 2 and I collected up a pile of craft, fabric and cookbooks and snuggled into the leather seats. About an hour later we had whittled the pile down to three that had to come home with us. All told it was a productive day!